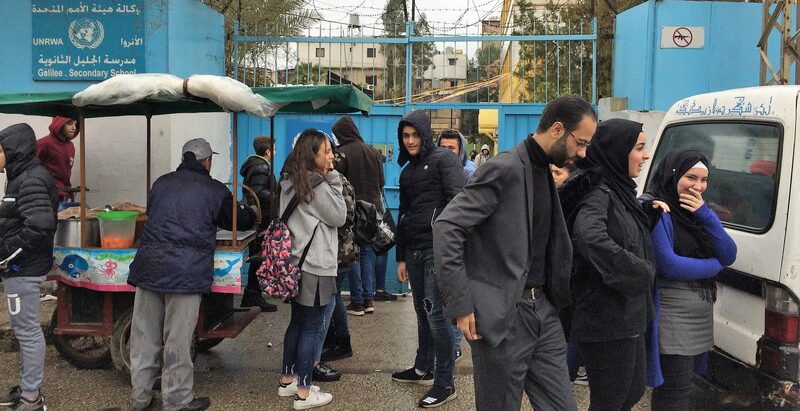 On a rainy January day in Beirut, patients were on edge at the Bir Hassan health clinic run by the United Nations Relief and Works Agency for Palestine Refugees in the Near East (UNRWA). Thumbing a string of orange prayer beads, Rashid Nasr, sixty-eight, said he visits the clinic monthly with his wife to be examined and pick up medication for their hypertension, high cholesterol, and diabetes—services provided at no cost by UNRWA that the Nasrs would otherwise go without. With some 65 percent of the Palestinian refugee population in Lebanon living in poverty, UNRWA’s services in the country are a matter of life and death for hundreds of thousands of people. The abrupt State Department announcement on January 16 that the United States would dramatically reduce its contributions to UNRWA threatens this clinic and countless other services that have been a lifeline for most of the region’s stateless Palestinians since the agency’s founding in 1949. Whether it is a political move to strong-arm Palestinian leadership, or just another example of Trump’s isolationist pull away from international organizations, the funding reduction is likely to further destabilize a region already facing ongoing upheaval and unprecedented flows of migrants. With this action, the Trump administration has not only withdrawn vital support from one of the Middle East’s most vulnerable communities: it’s also done so in a dangerously sudden manner. Instead of implementing a gradual drawdown of U.S. funding, which pays for more than one-third of UNRWA’s budget, the United States opted to reduce funding immediately, effectively pulling the rug out from under the agency after seventy years as its most reliable donor—and with no alternatives in place. In addition to further destabilizing the Middle East, cuts to UNRWA will further reverse America’s record as a generous provider of humanitarian aid, which has served as an important diplomatic tool. This administration appears bent on throwing that reputation, and asset, away. 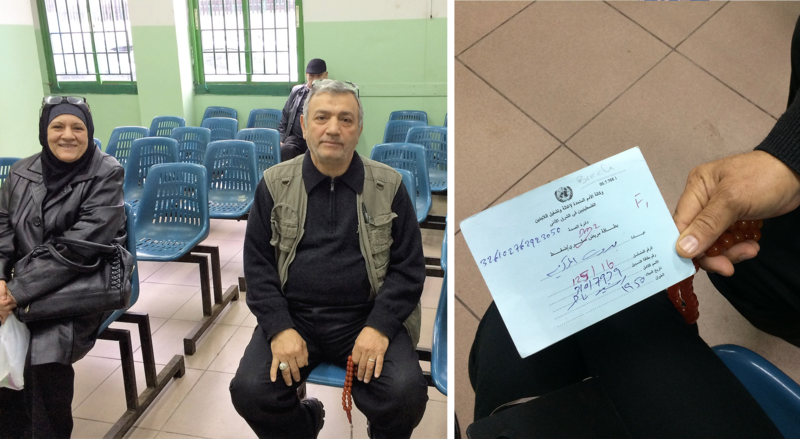 Rashid Nasr, 68, and his wife in the waiting room at the UNRWA health clinic in Bir Hassan, Beirut (left), holds his registration cards (right) in the waiting room at where they receive no-cost medication for hypertension, high cholesterol and diabetes. Source: Author photo. The United States has been far and away UNRWA’s largest single donor since its founding in 1949, providing more than $350 million in 2017. Last week, however, the State Department announced just a $60 million-dollar contribution, and dangled an additional $65 million to be withheld until further notice. UNRWA, already in debt, immediately launched a global fundraising campaign to make up for the funding shortfall. Its commissioner-general vowed to maintain services in the face of the most dramatic financial crisis in the agency’s seventy-year history. More than five million Palestinians in Jordan, the West Bank, Gaza, Syria, and Lebanon rely on UNRWA for the kind of essential services typically provided by state governments, including health care, education, and a social safety net for those 1.2 million estimated to be living in absolute poverty. The Jordanian government, which hosts over two million Palestinian refugees in addition to over 500,000 Syrian refugees, has voiced concern about the U.S. decision. Palestinian officials have added that it targeted the most vulnerable segment of their population. And several European nations have fast-tracked planned donations as a stopgap measure to prevent service cuts. The reductions also more broadly reflect President Trump’s isolationist “America First” pull-away from international organizations in general. Similar to the administration’s position on NATO contributions and on the United Nations as a whole, in her press briefing, Nauert said the United States expected other countries to step forward to help fund UNRWA. She also said the funding would be contingent on reforms within the agency, a position UNRWA spokesman Chris Gunness called into question in an interview with The Century Foundation, given that the agency has been in regular communication with the United States about reforms and was praised by U.S. officials just last fall for its management. This new threat to UNRWA’s core services puts pressure not only on the Palestinian leadership, but also on the host governments of Jordan, Syria, and Lebanon, all of which are dealing with their own domestic problems, and on Israel as well, which would be affected by increased instability in the West Bank and Gaza. On top of other issues, large Syrian refugee populations continue to be a burden in Jordan and Lebanon, and even in areas where fighting has ceased, Syria has a long way to go to recover from its civil war. Defunding UNRWA altogether could ultimately mean permanent resettlement of Palestinian refugees into their host countries, an issue that has long been publicly rejected by those governments and by Palestinian leadership (the “right to return” for Palestinian refugees is one of the so-called “final status” issues that will have to be settled in any future peace deal with Israel). For Palestinian refugees in Lebanon, pursuing a livelihood is extremely difficult. Jordan and Syria extend Palestinians many of the same rights they offer their own citizens, and Jordan even offers citizenship. But in Lebanon, where demographic issues are highly contentious due to a tenuous sectarian balance, Palestinians face strict government restrictions on employment and many live in overcrowded camps without essential infrastructure. Conditions have worsened in recent years with the influx of Syrian refugees to the country, which also brought tens of thousands of Palestinian refugees who had been living in Syria. Lebanon today has by far the most refugees per capita of any country in the world. At the clinic in Bir Hassan, the Palestinian refugees waiting for services attest to the central role that the UN agency plays in keeping them alive and afloat. Kafeh Abdu Rasul was there to speak to the administrators about the chemotherapy payments for her sister’s advanced breast cancer, half of which are covered by the agency while she and her siblings struggle to raise the other half through non-governmental organizations. 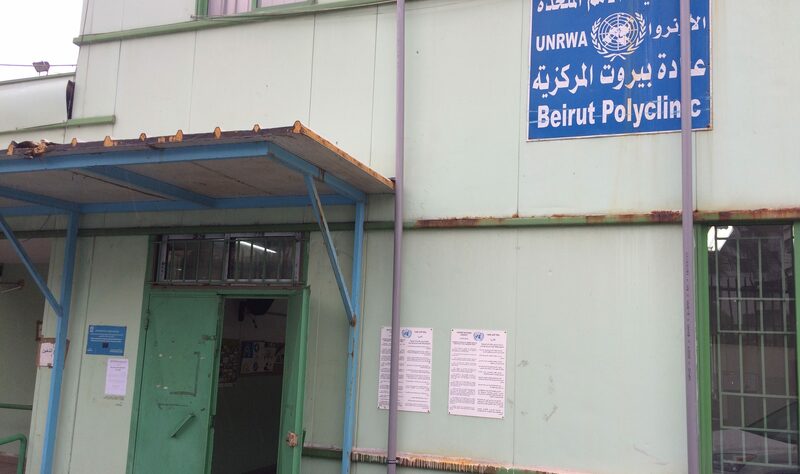 The UNRWA Beirut Polyclinic in Bir Hassan, Beirut. Source: Author photo. At the UNRWA Galilee Secondary School up the road from the clinic, where the parents of most its students are unemployed, teachers are concerned about the news as well. Lebanese private schools are unaffordable for most Palestinian refugees, and graduates almost always need to secure scholarships to go on to university. Many opt for the UNRWA vocation centers instead, which train students in professions such as business administration or hairdressing and are free. Palestinian students outside of the UNRWA Galilee Secondary School in Bir Hassan, Beirut. Source: Author photo. “These schools give teenagers hope. They keep them away from crime and violence,” said a teacher supervising students in final exams, who asked not to be named. UNRWA spokesman Gunness said the Trump administration’s announcement was “very abrupt,” and that the agency did not receive any official warning that they would not receive the usual amount from the United States this year. The U.S. announcement that it would withhold $290 million in expected funds, which is compounded with an existing $150 million-deficit due to the growing refugee population and increasingly dire conditions in Syria, Gaza, and the West Bank, has left the agency in urgent need of additional sources of funding, said Gunness. Until that money arrives, the fate of the 525,000 students attending UNRWA schools, the 9 million health clinic visits a year, and the 1.3 million people receiving emergency food and cash assistance hangs in the balance. The Trump administration has made clear that it will not hew to the strong U.S. tradition of humanitarianism on this issue and others, particularly not when it comes to aiding populations whose leaders criticize U.S. decisions. Rethinking any seven-decade-old policy has value, and few would argue that the status quo for Palestinians is ideal. But until a more comprehensive plan is in place for this stateless population, UNRWA’s services must be maintained at their current levels to prevent widespread instability. If the U.S. continues using this “diplomacy of revenge,” other nations and private charities ought to, and probably will, step up to fill the gap to avoid throwing millions in a region experiencing unprecedented turmoil deeper into poverty and hopelessness. If so, the current administration may get what it’s asked for; but we’ll have to see how much leverage and influence America loses in the process. Correction: The original version of this article stated incorrectly that the Trump administration had terminated U.S. funding of UNRWA. The funding was significantly reduced, not completely cut.